SketchBook Express is a free drawing tool for your iPad, but to really take advantage of it, you need to buy one or more of the three brush packs, which are 99¢ each. These are in-app purchases that you make by tapping the Info button (the i icon) at the top of the screen and then choosing the Store menu option. You can’t edit an object after you’ve created it, such as to move its line segments or change its curves. You can transform an object, sort of — what you can do is move, resize, and/or rotate a layer, so to be able to work on individual objects means that each must be on its own layer. When you open SketchBook Express for the first time, you’re asked whether to save your drawing on iCloud or on your iPad. The choice you make becomes your default storage for future drawings. 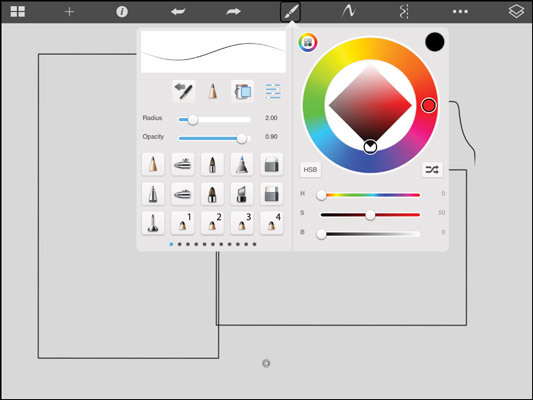 After you’ve created and saved a drawing, SketchBook Express opens with its My Gallery view, which shows thumbnail images of your drawings, whether on iCloud or on your iPad. Tap a drawing and then tap Edit to open it for further work. 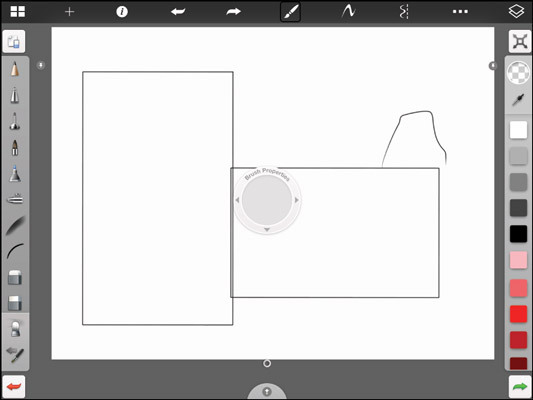 Create (the + icon): Creates a new, blank drawing at the dimensions you specify. You can change that square size’s default by tapping the > icon to its right. Duplicate (the icon of two + symbols): Copies the selected drawing, which you can then open. Create From (the flower icon with a +): Creates a drawing at the size specified using an image at the location specified: Photo Library (meaning the iPad’s Photos app), iTunes, Dropbox, or the iPad’s camera. Share (the icon showing a flower with a →): Copies the drawing as an image to Photos, iTunes, Flickr, Facebook, or Twitter; saves it to Dropbox; emails the file; or prints the drawing. Upload to iCloud (the iCloud icon showing a ­): Moves the file to iCloud; an iCloud logo appears on the upper left of the drawing’s thumbnail. Delete (the trash can icon). My Gallery (the icon of four rectangles): Returns to the My Gallery view and lets you save or discard the changes made to your drawing, as well as save the changes to a new copy. New (the + icon): Lets you create a new blank drawing, with the option to save the current drawing or discard your changes. Undo (the left-facing curved arrow icon) and Redo (the right-facing curved arrow icon). Pen (the brush icon): Tap this to get a pop-over of brush controls, such as pen tip, opacity, stroke color, fill color, and “ink flow.” Ink flow simulates a real pen tip by adjusting the appearance of the stroke based on the pressure and angle of your pressure-sensitive stylus, if you’re using one. Think of how a felt-tip marker stroke changes based on how you hold it and how hard you press on it when drawing on paper. Shape (by default, the freeform-stroke icon): Use its pop-over to select four types of shapes to draw: freeform, line, rectangle, and ellipse. Whichever you select displays as the button’s icon. Symmetry (the icon of a squiggle next to a dashed line): When you see one squiggle on the icon, SketchBook Pro draws objects normally. Tap the object to enter Symmetry mode. In Symmetry mode, anything you draw is drawn twice, with a mirror image created automatically for you. Text: For entering text labels. Transform: To display controls for moving, rotating, resizing, and flipping the current layer. Time-Lapse Record: To create a movie of your drawing as you draw it. Duo Sketch: To enable shared editing with another iPad user of SketchBook Pro or with an iPhone, or an iPod touch user of SketchBook Mobile. Both people must tap this option; then one of them must invite the other to share the drawing by tapping that other user’s device name. Both users can draw on the shared canvas as well as send notes to each other. When they end the connection, both users have a copy of their shared drawing. Add Layer (the + icon). Duplicate Layer (the icon of two + symbols). Import Layer (the icon of a flower and a +): Imports an image as a new layer. Merge Down (the down arrow icon): Merges the current layer into the one beneath it. You don’t need to keep opening the Pen pop-over to change your brush settings. Instead, tap the little ring icon at the bottom of the screen to display the brush controls along the left and right sides of your screen, for continuous access. You also see the Brush Editor wheel in the center of the screen: Drag down within it to reduce the opacity and up to increase it. To zoom in or out of the canvas, use the standard OS pinch and expand gestures. To move within the canvas, use the standard two-finger scroll gestures.